Wow! And he is 62 years old. THEY DID IT: Ultramarathoners Lim Nghee Huat and Yong Yuen Cheng have been running 50 km a day since mid-April to mark Singapore50. The duo crossed the finishing point at the Promontory at Marina Bay this morning. ~ by Hetty Musfirah Abdul Khamid, Goh Chiew Tong, and Alice Chia. The last day of the run began at 2am from Ion Orchard and the duo crossed the finishing point on Thursday morning (Jun 4) at the Promontory at Marina Bay at about 10.30am. SINGAPORE: Ultramarathoners Lim Nghee Huat and Yong Yuen Cheng have accomplished their mission to run 50 kilometres each day over the last 50 days. They crossed the finishing point of their last run on Thursday morning (Jun 4) at the Promontory at Marina Bay at about 10.30am. Upon crossing the finishing line, Mr Lim said triumphantly: "Mission complete! I feel very relaxed actually." The 62-year-old said that the marathon, called Go50, was "tougher than expected". "The toughest thing was to wake up and do the same thing every day. It can be very boring. But I had a strong belief that I will overcome every day of the run," he said. "I didn't look at the run as an entire 50 days, but I focused on each day as it is." The duo usually start running at around 7am each day. After extensive warm-up exercises in the wee hours of the morning, they then embark on their daily run, clocking 50 kilometres sometime in the afternoon. Mr Lim and Mr Yong both agreed that the one thing they wanted to do after completing their mission was catch up on sleep. "I have been waking up every morning at about 5am and am lacking sleep," said Mr Lim, who admitted that his body is definitely "not structured" to handle 2,500 kilometres. He is currently suffering an injured tendon on his left foot. "If you touch the lower parts of my legs right now, I would definitely feel pain." On top of that, unexpected challenges also surfaced during the run. Mr Lim faced diarrhoea and vomiting on one of the days - to which the route had to be adjusted so that he could have easy access to toilets. Yet, the duo recorded the fastest run on that very day. The pair started the run on Apr 16 to mark Singapore's 50th birthday. Each day takes on a different theme. There are altogether 50 themes in the Go50: A Nation in Motion initiative, each symbolising the nation's founding father, the late Mr Lee Kuan Yew’s contributions and character traits. The duo finished the marathon together with over 50 runners representing different SEA Games celebratory partners. 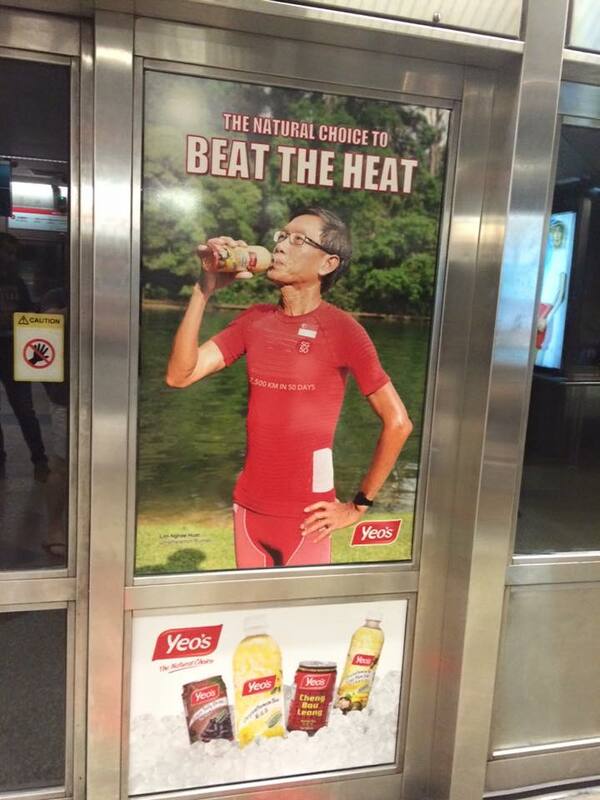 "This run is more than just a run," said Mr Yong. "It's a project where youths of Singapore can learn values, values of hard work, discipline, mental toughness, resilience and perseverance." The last day of the run began at 2am from ION Orchard. For their efforts, they have also been chosen to ignite the 28th SEA Games flame (pictured below), which will be used at the SEA Games Torch Parade later on Wednesday evening. 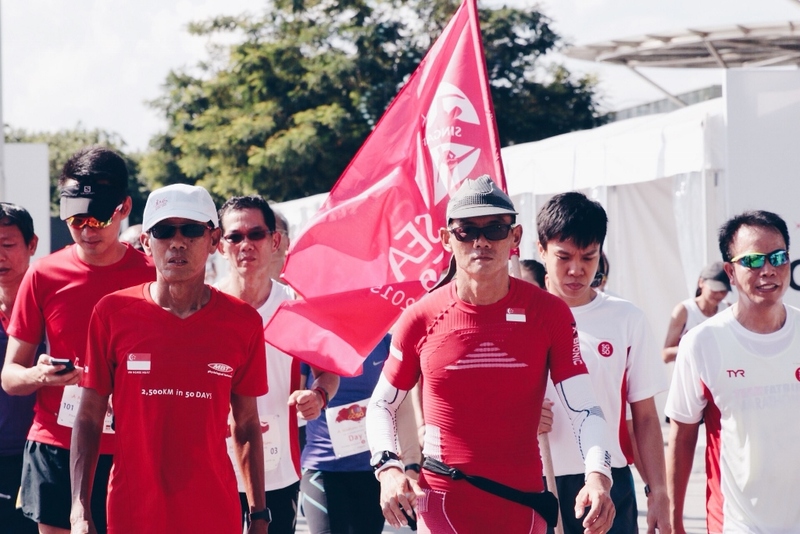 Ultramarathoners Lim Nghee Huat and Yong Yuen Cheng plan to cover 50km per day over 50 days, to celebrate Singapore's 50th year of independence. On the 9th day of the challenge, they ran from MediaCorp's headquarters to its upcoming campus at one-north. 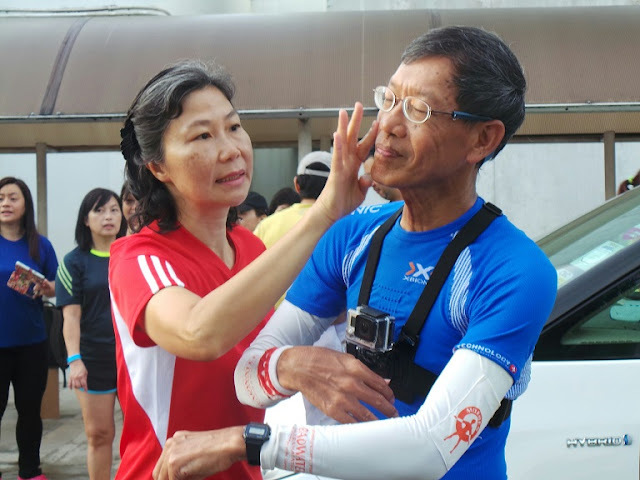 SINGAPORE: Despite challenging weather and physical exhaustion, ultramarathoners Lim Nghee Huat and Yong Yuen Cheng are pushing ahead with their plan to run 50km daily over 50 days, as a tribute to the late Mr Lee Kuan Yew and to commemorate Singapore's 50th birthday. 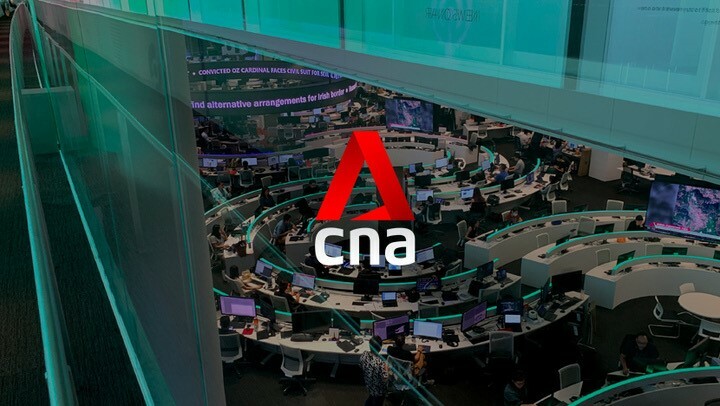 They kicked off the ninth day of their challenge on Friday morning (Apr 24) at Caldecott Broadcast Centre, along with about 50 MediaCorp staff. The run, called Go50: A Nation in Motion, commemorates the late Mr Lee’s contributions to building the nation, and honours some of his character traits. It also marks Singapore's 50th year of independence. Each day of the run will be anchored by a theme based of one contribution or character trait. A total of 50 themes have been decided by the Institute of Technical Education students, such as independence, self-reliance, and kindness. The theme for Friday's run was "Multi-cultural Vibrancy". “Every part of our bodies is aching,” said the 61-year-old Mr Lim, before the broadcaster’s senior management flagged off the run. Mr Lim is a Current Affairs editor at MediaCorp. "Two days ago, my legs felt so heavy that even walking was difficult, but I managed to get through it. Yesterday I felt my toes were a little painful. But today, I feel better. I haven’t run continuously for so many days, but I think I’m still getting used to it." 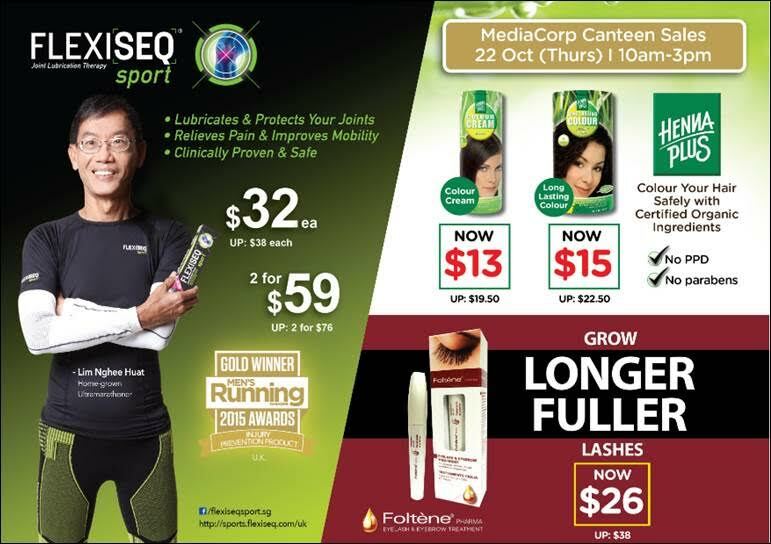 Mr Lim’s wife, Mdm Deborah Mok, revealed that he had injured his knee, but is still in high spirits. She said that the roots of some trees lining the route had caused the pavements to be uneven, making the runners susceptible to tripping. Mr Yong, 43, also fell because of uneven pavements on the way back to Caldecott Hill on Friday, said Mr Lim. He sustained minor injuries but completed the run. Mdm Mok added that Mr Lim is still in high spirits despite the setbacks. “He’s feeling very good today, especially with support from colleagues,” she said. The duo's route on Friday passed locations including the Bukit Batok Transmission Centre and MediaCorp’s new premises at one-north. “I hope that when I’m at his age or older, I’ll still be able to carry on exercising,” she added. Mr Jon Li, also from MediaCorp's production resources, called Mr Lim Nghee Huat a “hero”. “He’s like Ironman,” quipped Mr Li. “I think this is a very good opportunity for us to take part, to celebrate SG50." Despite the heavy downpour in the afternoon, hordes of supporters turned up at the finish line to greet the runners. They waved and cheered as the duo jogged towards the entrance of Caldecott Broadcast Centre, about eight hours after kicking off their run at the same location. Mr Lim said the outpouring of support has been "inspirational and encouraging". "We had ups and downs over the days, and the people around us gave us motivation," said Mr Lim. "For runs that last seven hours, it can be very boring (without them). We met many residents along the way and they also cheered for us." The run will end on Jun 4, the eve of the start of the Southeast Asian Games. to prepare for his run ahead of the flag-off.